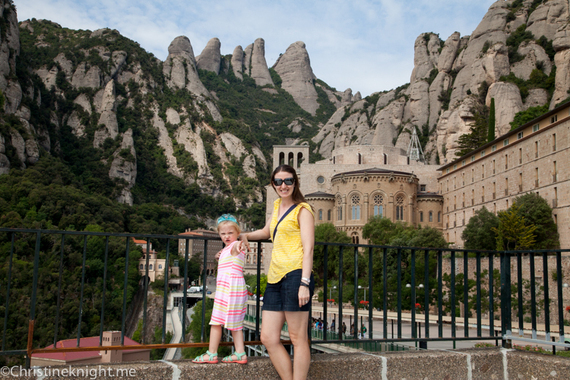 If you're planning a big trip with little kids, you may want to take note of the lessons we learned from spending six weeks visiting four countries and five cities (via eight flights) with a preschooler. Writer, traveller, lover of cake. Travel with kids can be the most enriching and wonderful experience -- or it can be a complete nightmare. I recently took my almost 4-year-old daughter on an around the world adventure with my husband. If you're planning a similar big trip with little kids, you may want to take note of the lessons we learned from spending six weeks visiting four countries and five cities (via eight flights) with a preschooler. Unless your kid is a strong walker, bring a lightweight umbrella stroller. We thought our 3-year-old was done with a stroller, but we didn't take into account that we would be walking an average of 6 miles a day, and that our child would be battling jet lag as well as over stimulation in a new environment. She was exhausted. I cursed myself for giving away our trusty travel stroller and bought a new stroller a few days into our trip. Be prepared to battle hunger, thirst and boredom on long flights. Take an empty water bottle and fill it when you get through security, and pack dry snacks and liquids up to 100ml like yoghurt sticks. If you're traveling with an infant or toddler you may take a "reasonable amount" of liquids such as milk or baby food that is not subject to the 100ml rule. Security will also allow small ice packs to keep dairy cool. Take lots of pairs of underwear, wipes and a spare set of clothes for each of you (even the adults), plus some small new toys and activities that your child will love. Hand out the toys one at a time when a meltdown is imminent. Charge up the iPad with new shows and games. A flight is not the time to limit screen time. This is a big time waster if you only have a short time period to be away, but we found it really helpful in getting over the jet lag faster. We planned our flights to arrive at our destination and then go straight to bed. As a result, our daughter would wake up a few hours earlier than normal, but more like 4:00 or 5:00 a.m. rather than 1:00 or 2:00 a.m. Our daughter is easily entertained on planes and a terrible sleeper, so this works well for us. If you have a kid who sleeps like the dead on a plane and who is not easily entertained, then a night flight is better for you. Things you should pack lots of: underpants, lightweight tees, shorts/skirts/dresses. Light is key so you can wash clothes and have them dry overnight hanging up in the hotel bathroom. I always pack travel detergent so I can wash clothes in the sink, and stain remover because I use it on my daughter's clothes pretty much every single day. Style-wise, I prefer items that cover more skin over her chest and shoulders rather than strappy singlets or dresses to give her more protection from the sun. I never travel without sunscreen, either. I take a few small ones for my handbag as well as a larger one to leave in the hotel. For our feet, even in summer I pack a pair of closed toe shoes for my daughter (which she wears on planes), as well as shoes that can be worn in water, such as Saltwater sandals. Always pack a small medical kit in case of scrapes, blisters, cuts and so on. We include child pain relief, mosquito repellant and stop-itch creams in case of bites. Anything fancy you don't want stained or ruined on the trip, for both you and the child. Heavy clothing that takes days to dry. New shoes that haven't been worn in. Delicate clothing. Expensive handbags or jewelry. We chose to visit cities that had lots to do within walking distance of our accommodation, or a short subway ride away. After all of that flying the last thing you'd want to do is arrive somewhere and then have even more travel to do to see the sights. We stayed in both apartments and hotels on our trip, and there are pros and cons to each. Hotels were great in areas where we wanted to be close to everything, such as Barcelona and London, where the apartments were a bit far to then commute each day with an already tired child. We all ate dinner together each night and pretty much went to bed at the same time too -- it was a bonding experience. In New York we stayed in an apartment for two weeks that was central and found it the best of both worlds in terms of location and amenities. My preferred option would be a centrally-located apartment so we can do our washing and make basic food. Try to get breakfast included so you can fill up and grab some fruit and pastries for later, and make sure wifi isn't an added charge. We stayed at Grosvenor House in London and had an amazing breakfast included but not wifi, which was a big, unexpected charge. Your itinerary with a little kid should list one single thing to do each day. Plan to spend more time doing that one thing, and getting to and from there, and don't try to squeeze in single thing you want to see. You'll be so tired you don't enjoy it. The journey is part of the fun for kids, so allow time for taking a look at parks, buildings and trains on route to your actual destination. We planned activities that gave everyone a chance to enjoy themselves. We visited cathedrals, playgrounds and also had a fancy high tea. With all of our needs being met, all three of us enjoyed the trip. My husband and I were happier to spend time doing "kid" things like the said playgrounds when we knew that we were also going to be able to visit amazing places like Sagrada Familia, too. Taking our daughter to places we wanted to see for ourselves also taught her to put up with doing things that made other people happy even if she personally didn't care for it. It was a moderately successful lesson that we are still working on. We were actually pleasantly surprised with how she enjoyed a lot of "adult" sights, such as the Familia. I have a beautiful memory of my daughter dancing in a rainbow shining through the stained glass windows inside the cathedral that will stay with me forever. We thought we had planned well with a week or two in each location along our trip, but it was still a lot of travel -- too much. Next time, we will stay even longer in one place, like a month, and go at an even slower pace as our 6-week trip left us all exhausted. A few weeks before you fly out, log in to the airlines website and request a kids meal. You cannot ask for one when you are on the plane as they are made to order. At home I have a strict schedule for our daughter, especially with dinner and bedtime. No late nights, very healthy food, designated meal times. On our trip, however, we put enjoyment of the trip before our daughter's schedule to make life a bit easier. We ate out every night. Our daughter was in bed late and slept in. She ate way too much pizza and grilled cheese sandwiches. Bending the rules was fun for us all. Has anything changed now we're home? Nope. We are back, without fuss, to our schedule, family rules and diet. Holiday success. Christine Knight writes about navigating the world and parenthood at Adventure, Baby!. Follow Christine on Twitter, Facebook and Instagram.